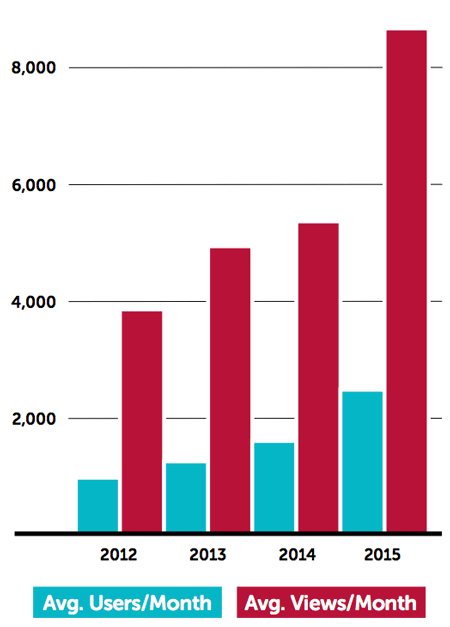 Going From A Two-Person Startup Offering An Unknown Service, To 200+ FDA Approvals. 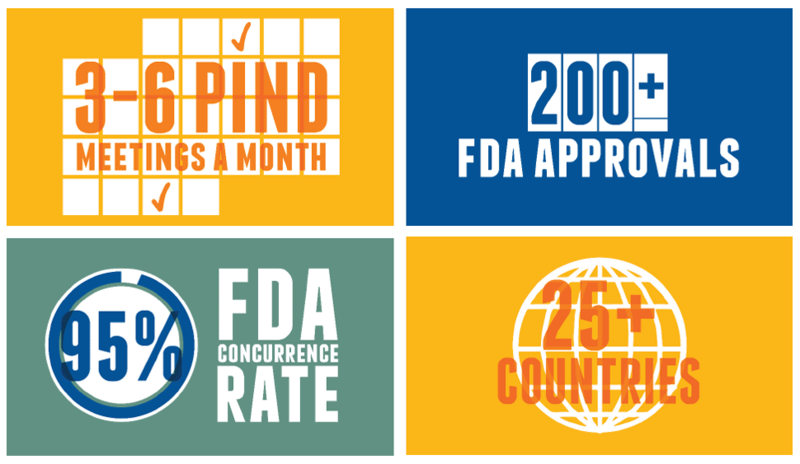 Camargo Pharmaceutical Services was founded in 2003 by Ken Phelps (president and CEO) and Ruth Stevens, Ph.D., (chief scientific officer and executive vice president) — the same year the FDA introduced guidelines governing the 505(b)(2) approval pathway. In 2007, Camargo partnered with SCORR Marketing. While the first objective was concentrated on traditional brand promotion to make Camargo the industry’s 505(b)(2) partner of choice, Camargo’s secondary goal was less conventional. Because the 505(b(2) approval pathway was relatively new, the industry lacked awareness, let alone an understanding of the challenges and benefits of 505(b)(2) necessary to appreciate the value Camargo offered. Therefore, SCORR needed to build a brand that would also function as a means to educate the industry on 505(b)(2) and its advantages. 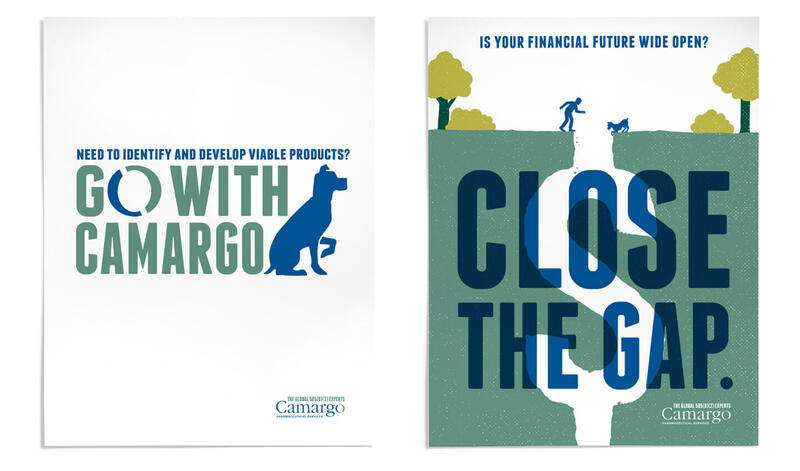 Camargo’s first Big Idea — the visual concepts and core messaging that articulated Camargo’s value proposition — was based on the adage, “You can’t teach an old dog new tricks.” SCORR developed the brand to draw attention to Camargo’s ability to use public data from existing drugs, commonly referred to as “old dogs” in the industry, in order to move new or reformulated compounds faster through the 505(b)(2) approval pathway. Though Camargo had a solid business plan and model, the company needed a marketing strategy to match. 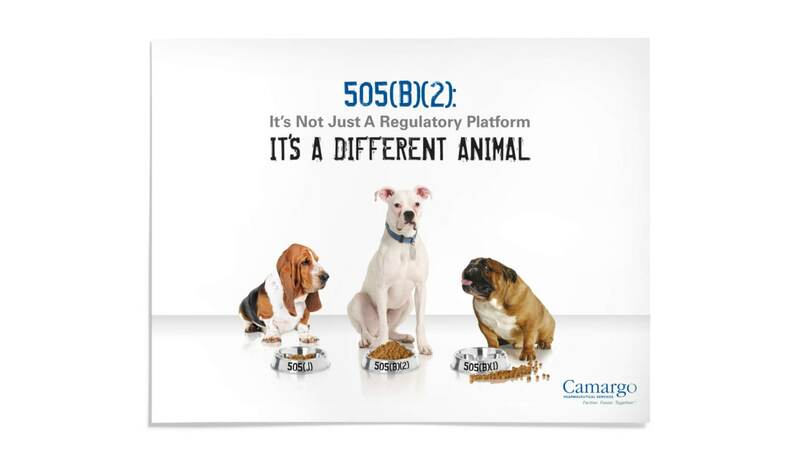 Striking print and online advertisements featuring Camargo’s canine mascot, a white boxer, served as an introduction for those wanting to learn more about 505(b)(2) and Camargo. Along with this distinctive presence, SCORR developed white papers, articles, a website with a resource center to house content, and even a blog called the “Drug Kennel,” which remains active to this day. Because Camargo was rapidly gaining brand visibility and generating inbound traffic, SCORR also rolled out a comprehensive campaign in a trade show setting. It wasn’t long before the 505(b)(2) pathway started generating interest and gaining popularity among product developers. In 2009, Camargo was recognized by the Cincinnati Business Courier as one of Cincinnati’s 55 fastest growing private companies. By 2012, Camargo had opened a second office in the U.S. and established a sales arm in Israel. However, while there were plenty of success stories in 505(b)(2), and Camargo was the foundation of many of those stories, there were soon 505(b)(2) competitors in its space. It was essential that Camargo and SCORR capitalize on success and momentum to ensure that Camargo continued to stay above growing competition. For this, Camargo relied on SCORR’s market intelligence. Since partnering with Camargo, SCORR has conducted comprehensive market intelligence initiatives to determine where Camargo is positioned in the minds of its clients. In the early years, one thing was clear: Much of the industry was unaware of the 505(b)(2) pathway and the benefits it presents. By Camargo’s 10-year anniversary in 2013, perception studies showed that the industry had become more conscious of 505(b)(2); however, many who had yet to come in contact with Camargo were still under-informed about the specific benefits of the pathway. SCORR’s market intelligence team discovered a critical misconception: Because 505(b)(2) is a regulatory pathway, many industry leaders believed that Camargo only offered regulatory services. In reality, Camargo was and is a full-service development partner from concept to commercialization. Beyond that misconception, there was another. Many thought of 505(b)(2) as just another regulatory pathway, not realizing that it can lower risk while also saving time and reducing costs. Armed with this intelligence, SCORR developed the “Different Animal” campaign, which represented a shift from an educational/informational brand, to one that is more overtly promotional. 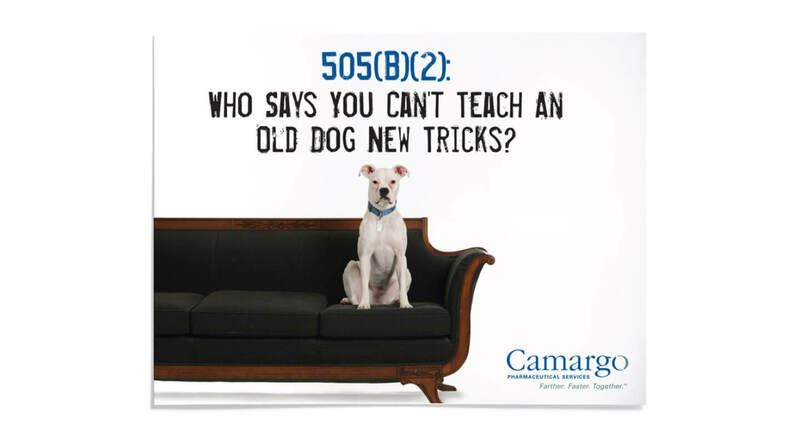 The campaign placed Camargo’s mascot alongside two new dogs to represent 505(b)(1) and 505(j), which are alternative development pathways to 505(b)(2). The dogs facilitated a smooth comparison between the benefits and purposes of the pathways. While much of the tone of Camargo’s original messaging remained the same, newer materials emphasized Camargo’s full-service capabilities across the entire drug development process and highlighted the lower risk, reduced cost and faster speed to market that Camargo could sniff out along the 505(b)(2) pathway. Recent changes in the industry, such as the pharmaceutical patent cliff and ensuing generics cliff, are pushing investors and developers alike to seek out alternative development pathways, namely 505(b)(2). As a result, many of the industry’s largest, most well-known clinical research organizations (CROs) offer spin-off 505(b)(2) services. Camargo, however, is in a strong position. Guided by SCORR’s effective marketing and brand strategy, Camargo has established quantifiable proof of its effectiveness as the most proficient 505(b)(2) development partner. To ensure the industry could fully realize these benefits Camargo offers, it was important for the brand to keep up with the pace Camargo’s thought leaders set. The brand needed to symbolize the company’s credibility and the manner with which its team attains success for clients. For these reasons, SCORR knew that in late 2014 it was time to get to work on a fresh take of Camargo’s existing brand. To build upon Camargo’s capabilities and history, SCORR created the new “Go With Camargo” Big Idea, supported by a series of breakouts that appeal to specific audiences by speaking directly to the pressure points that they face. 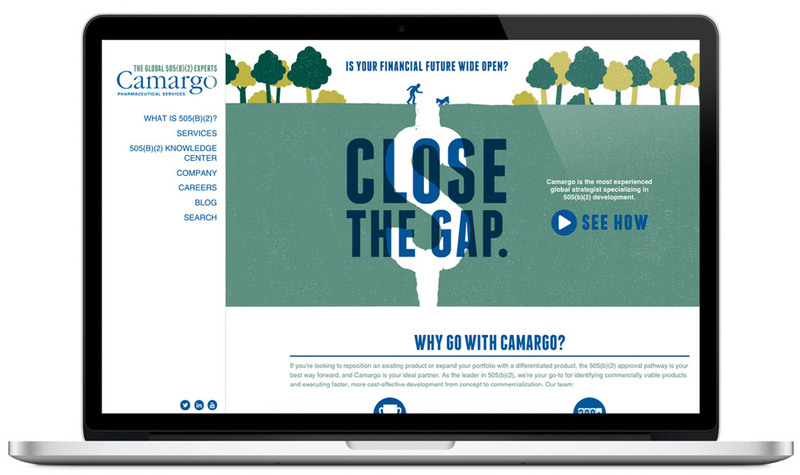 This new campaign was blunt in tone, yet it offered a charming spin that mirrored the marriage of the no-nonsense business acumen and the personable interaction that Camargo provides. SCORR made an effort to genuinely align Camargo’s brand with its internal culture. The team embraced the branding and campaign messaging, fully committing to its implementation and consistent application. This internal buy-in was central to the brand’s external success. This book covers the history of the company, the new branding and the rationale behind communications strategies for business development, internal/employee affairs and more. 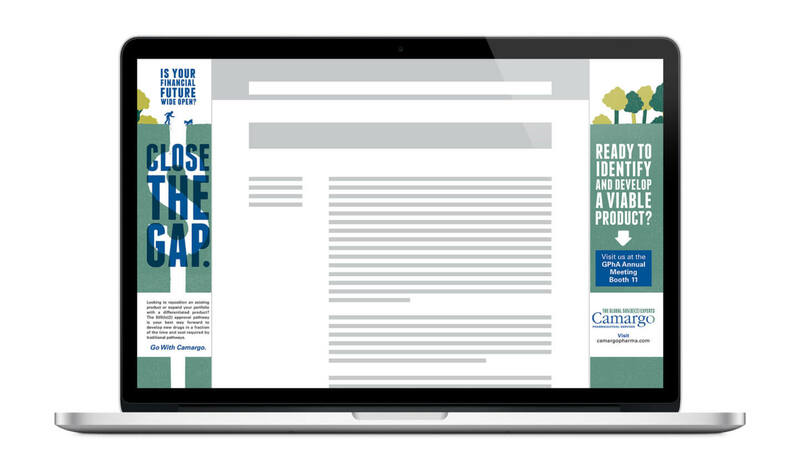 This convenient reference tool ensures continuity across all marketing and communications materials, providing details on the correct application of the Camargo identity. As the brand progressed, SCORR continually worked with Camargo to develop its trade show presence. One of the first guerrilla marketing tactics SCORR deployed for Camargo was to use dog walkers outside of a major trade show. The dog walkers wore branded attire and handed out information about Camargo, directing potential leads to the booth. Camargo’s Yappy Hour meet-and-greet featured custom bottles of wine, candy bones in dog dishes, branded coasters that served as handouts and more. Camargo’s booths now feature a 3D, lighted centerpiece, while a podium with a built-in monitor showcases the brand video and functions as a touch screen to demonstrate interactive sales presentations and survey mechanisms. Camargo has almost tripled its yearly revenue since partnering with SCORR and has goals set to continue on this trajectory. Camargo’s interactive site provides access to articles, white papers, case studies, blog posts and more. 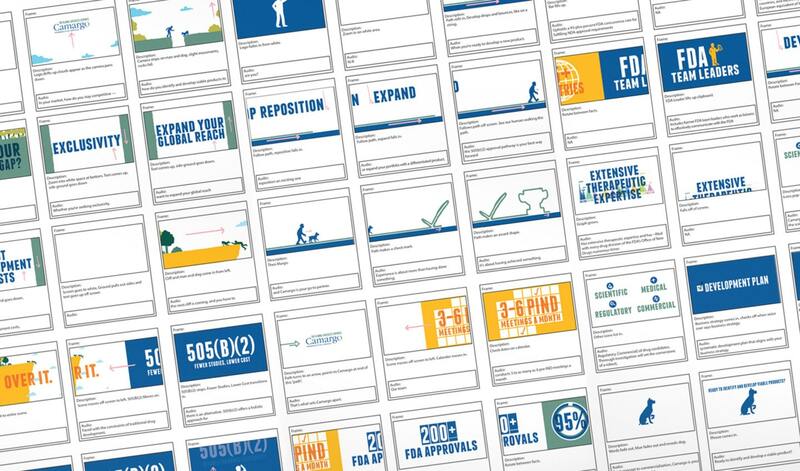 A brand video, using custom animation, was produced for use on the website, in social media posts and in trade show displays. Camargo’s social media program plays a key role in the company’s overall integrated program, promoting unique content used in videos, white papers, articles, etc. Camargo’s email open rate sits at an industry high — averaging at a 44% open rate (2014-2015), having nearly doubled since 2011. 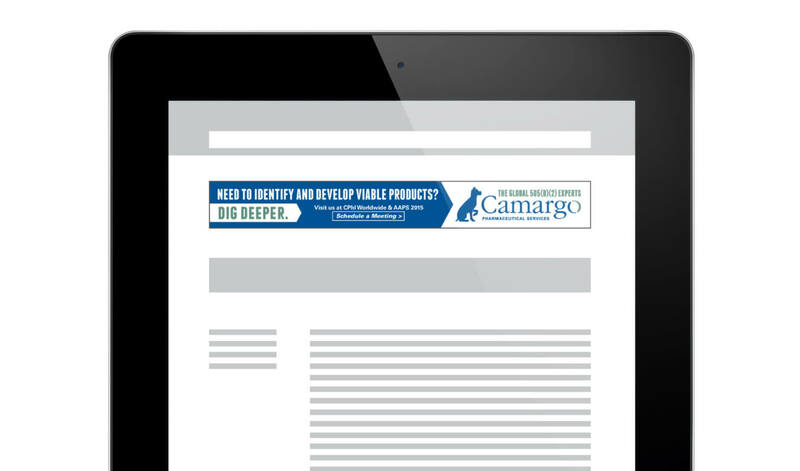 Media placements were directed heavily toward specific target audiences, with placements planned around key industry events and explaining how Camargo can help its clients surmount the challenges they commonly face. These placements include print, digital, email, video and audio (podcasts). Annual surveys benchmark client satisfaction data year over year, an essential piece to understanding why clients choose Camargo. Camargo and SCORR received Best Of Show and the Award of Excellence at the 2015 Annual Nebraska PRSA (Public Relations Society of America) Gala. Today, Camargo is the choice partner for those looking to embark on a development project via the 505(b)(2) approval pathway. 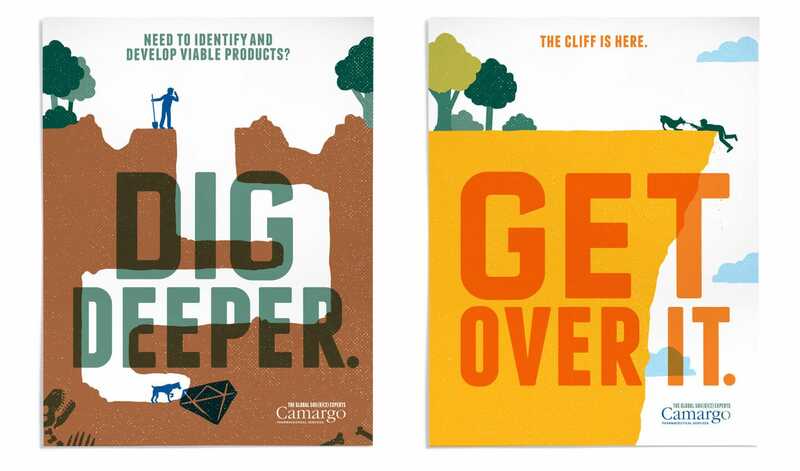 In size, capabilities and presence, Camargo has made great strides since adopting its branding in 2007. Camargo’s return on investment far exceeded expectations as the company saw elevated awareness following the brand launch and consistent growth through 2015. 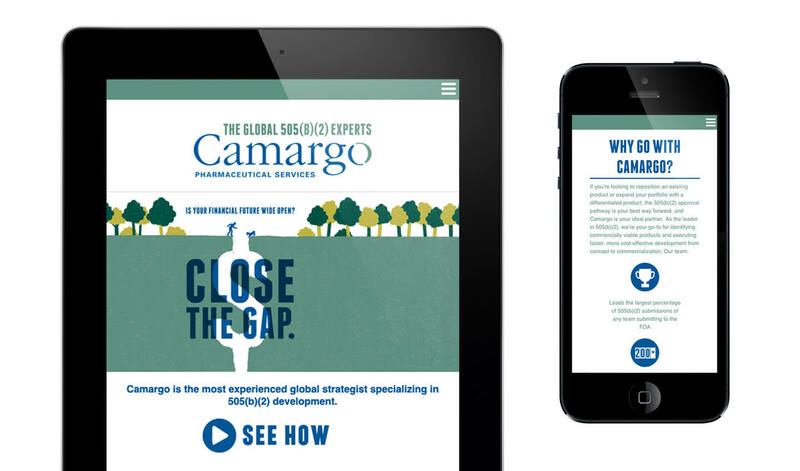 The “Go With Camargo” brand has positioned Camargo as the top-of mind industry expert in 505(b)(2) and provides a platform for Camargo’s key opinion leaders to publish thought content. Camargo’s leadership team is being sought after to speak on the 505(b)(2) topic today — recognizing 505(b)(2) as a growing solution for the industry and acknowledging Camargo as the global experts. 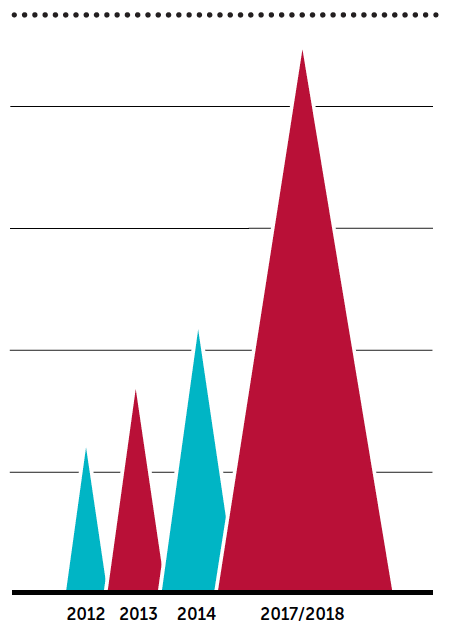 Share: Going From A Two-Person Startup Offering An Unknown Service, To 200+ FDA Approvals.